« Philanthropic? I guess the bombs were sent pro bono? 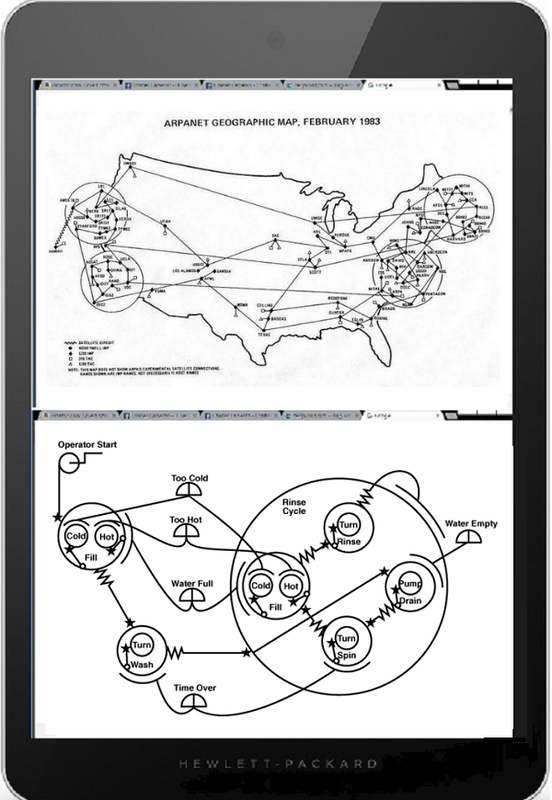 This particular pairing of images struck me today when Mike Walker tweeted it the Arpanet map in quoting a World Economic Forum post — and the memory it called up was another image I found, who knows where, quite a few years ago, of the workings of a washing machine. We really have two tips of the iceberg of a hugely pervasive language of node-and-edge-based graphs here. I expect there’s more but that’s what a quick scan brought up. This entry was posted on Thursday, May 19th, 2016 at 11:06 pm	and is filed under Charles Cameron, computers, connectivity, DARPA, Doublequotes, graphical thinking, map, Uncategorized. You can follow any responses to this entry through the RSS 2.0 feed. Both comments and pings are currently closed.